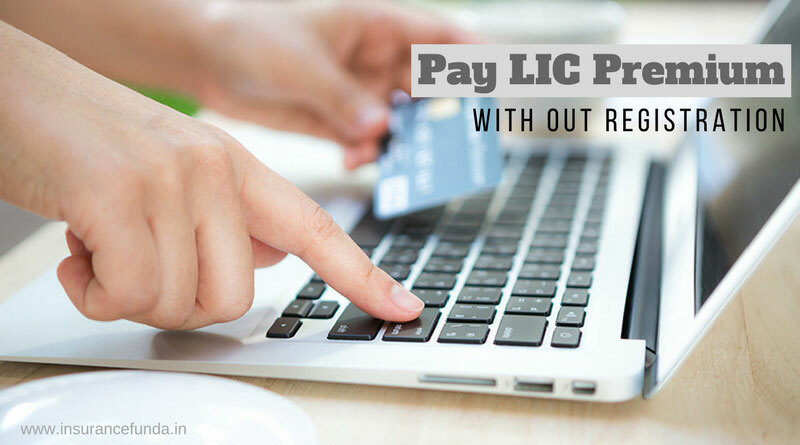 Pay LIC Premium Without Registration – Complete step by step guide. LIC of India provides ‘online’ premium payment facility through it’s E -services portal. It also offers Premier Services, which provides higher level of services to LIC’s customers. Both e- services and Premier Services can be accessed only after completing the registration process. The registration to the e-services portal will enable you to pay premium and track the details of all your policies at a single place. But one thing to remember is that, in order to complete the registration process, customers should provide their PAN and Aadhaar Number at the LIC portal. This could cause some difficulty to Non Resident Indians (NRI’s) and Foreign Nationals of Indian Origin (FNOI) as they do not have an Aadhaar. It is expected that LIC will develop a special method to allow FNOI’s also access the e -services portal. But for the time being they can also pay their LIC renewal premium using ‘Pay Direct – with out registration’ method. Payments allowed are (1) Renewal Premium (2) Loan Repayment and (3) Loan Interest Repayment. Verification has to be completed before initialising payment. Policy Number, Date of Birth and Instalment Premium has to be submitted for verification. No charge shall be applicable for payment modes other than Credit Cards. If you pay premium using Axis Bank Credit card, no charge will become applicable. Maximum limit for Credit card payment other than Axis Bank Credit card is Rs. 1,00,000. Following information should be ready with you before starting the payment process. Net banking account/Credit or Debit Card/UPI BHIM credentials/e-wallet. Locate the Link – ‘Pay Premium Online’ and open it. Select ‘Pay direct’ in the next window. Select ‘Renewal Premium/Revival option’ in the menu as shown in the figure given below. Next window will show three steps involved in the process of premium payment. Click on Proceed button as shown. Now you will have to do the customer validation. Policy Number, Premium (with out Service Tax – if Any) and Date of birth has to be submitted along with the email id and mobile number. Enter the ‘Captcha’ verification and go to the next step. Now the premium amount due – to be paid will be shown as given in the info-gram below. Once you are satisfied with the premium particulars, you can move on to the next step by clicking on the ‘Proceed’ button. Payment of premium is available through several methods and you can choose the suitable method based on your convenience. Special options are available for Standard Chartered and Axis Bank and if you have bank accounts in any of these banks you can directly choose these options. Another payment option available is through BHIM UPI. BHIM UPI is a new payment method developed by Government of India for easy and secure payments. IF you want to use UPI for payments select the second or third payment option. Read more : Know how to use BHIM UPI to make LIC premium Payment in simple steps. If you want to pay premium using Internet Banking, Debit Cards, Credit Cards or e-Wallets use the first option. You can select the Bank or Credit/Debit card type in the next screen and complete the transaction at your bank web site. Once the payment is successful you will receive the ‘Premium payment successful’ message as shown here. Pay LIC Premium Without Registration – (Pay Direct Method) – Charges involved. All the payment channels except Credit Cards do not bear any charges or convenience fee. No Convenience fee or charges shall be levied on Axis bank Credit cards. Charges applicable to VISA/Master Card/Amex Card is as shown below.